"...The engineers managed to get a few light foot bridges across the Roer, but at a great sacrifice to men and equipment. Some of us were loaded on rubber boats for the crossing while others of us used the costly foot bridges. Not all of up made it across..."
by S/Sgt. "Lucky" Sal Conigliaro, 406-G.
My initiation into the Military was very interesting. I was not drafted! I enlisted into what was then the U.S. Army Air Force. Back in 1942, the Air Force was part of the Army. In March I took what was called 'basic training' in Miami Beach, Florida for thirteen great weeks. I was quartered in what was a hotel that the military had taken over and located on the Indian River. After this vacation in paradise, I was sent to Aircraft sheet metal school in Chanute Field outside Champaign, Illinois. Following about eight to ten weeks of this training, I was then shipped to a P-51 Fighter Squadron in Key Field which was outside Meridian, Mississippi. We worked on aircraft, and repaired bullet and shrapnel holes in the body and wings of the planes. After a short period of time, we were made aware of a new program which was available to qualified personnel called the Army Specialized Training Program, A.S.T.P. This was an accelerated educational program of engineering. In order to qualify, you had to have at least a 124 I.Q., and the ability to pass the examination they would give. So, I gave it a shot and was fortunate enough to pass! Lo and behold, they assigned me to Georgetown University in Washington, D.C. What could have been better! I was four hours from home and this was going to last for two years. Wrong! This program was likened to the Cadet System used at West Point Military Academy. We were schooled from 8am to 5pm with full roll-call at 6am, dress parade with a marching band, and raising and lowering the flag, and retreat. It was great! In a few short months I advanced from Platoon Leader to Battalion Adjutant in which I was bellowing out commands for the nightly retreat ceremonies. I also completed a course of instruction and received my certification in JUDO. Besides loving it all, I was being educated to be an engineer. What a great deal! About six months into the program, the military decided that they needed more infantry and they shut down all schools and shipped 30,000 of us to various assorted Infantry Divisions for infantry training for combat. 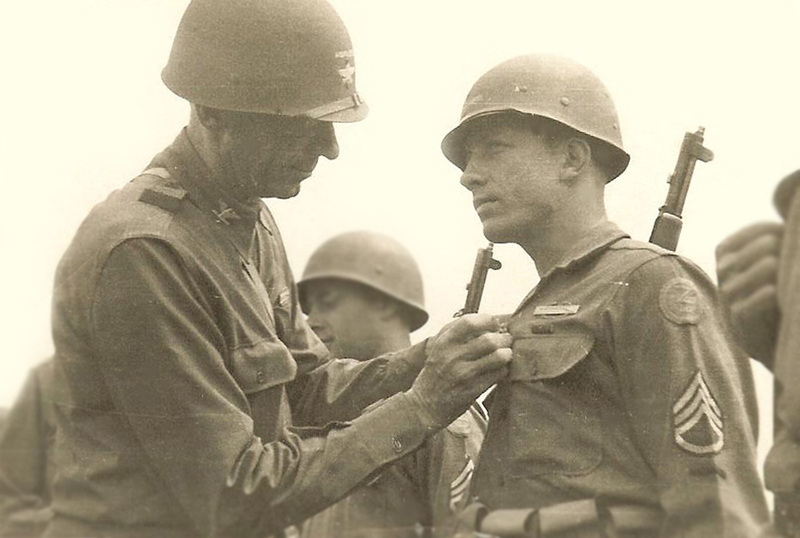 It was at that time that I was assigned to the 102nd Infantry Division. I soon found myself at Camp Swift, Texas, along with a whole bunch of former ASTP Cadets; or ex-Cadets! It was at Camp Swift where for the first time since I enlisted, I began to feel like I was a soldier. And there I was, with many, many others, where we infantry trained for some eight to ten weeks. Our training was comprehensive. Physical training, firearms training on M-1s, carbines, Browning Automatic Rifles (M-1918 BAR) that were light machine guns, Thompson Sub-machine guns, Bazookas, 45 automatics, hand grenades and flare guns. We were taught how to fire them, take them apart, and put them back together again, and hopefully be ready for use. We ran obstacle courses, climbed walls, jumped over ditches, swung on ropes, climbed and descended ladders. We took twenty mile hikes, bivouacked, double-timed with full field packs, and bitched all the way like any good soldier would do. Our feet were sore and bleeding in some cases, and our backs were aching. The food sustained us but it was very poor. Each day brought us closer and closer together as we became a Squad, a Platoon, a Company, and Battalion, and so on. We all were proud of the OZARKS and we showed it. The original cadre of the 102nd initially was not happy at the fact that they were getting a whole bunch of schoolboys. They let us know that they did not think we could take it. As it turned out, they were pleasantly surprised. Then it came that fateful day when the Division was ordered to a POE (Port of Embarkation) in New York. We became part of a huge convoy which I understood to be the first to land directly in France from the U.S. We loaded on Liberty ships and set sail. It took 23 days to make the crossing taking the southern route; very southern. We landed in LeHarve, France and loaded on boxcars and were carried to Aachen Germany. Now, for the big question: Were we trained for combat? Probably yes! Were we prepared for combat? Probably not! I do not believe that at that time you could really prepare for the horror of war; the bombs, the shells, the guns, the wounded, the maimed, the death, the filth, the food, the foxholes, the cold and the heat, the destruction, the counterattacks, and the total insanity of those who caused it to happen. There is no way to be 'prepared' for all of this in training. You have to live it, or as too many did &endash; die in it! We were shot at in training, but under very controlled condition, and we knew we'd be okay as long as we kept our heads down. However, in combat it is very different, and your ability to survive is in large, partly based on instincts and common sense. How do you train someone to get used to the cries of the wounded; the screams of the dieing; the sight of your buddies bleeding and filled with fear of the unknown in their eyes? In my opinion, and experience, nobody can be trained for that! The one thing the American Soldier knew was that he was one of the 'Good Guys.' And, the Axis partners were the 'Bad Guys.' In our hearts, minds, and souls, we knew that the 'Good Guys' were going to win, so we fought with everything we had &endash; against all odds &endash; because we knew we were right! To achieve success in anything one does, one must have the desire to succeed, and one must always maintain a positive attitude. The 102nd knew we would prevail and WIN &endash; and we did! 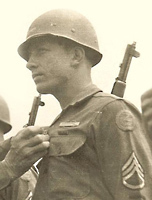 Third Squad Leader of the Second Platoon of G Company, 406th Regiment (2nd Battalion) 102nd OZARK DIVISION. The above story, "MY INITIATION INTO THE MILITARY", by "Lucky" Sal Conigliaro, 406th, Co. G., was forwarded to World War II Stories -- In Their Own Words by Nanette Fenton, daughter of the late "Lucky" Sal Conigliaro. The story is re-printed here on World War II Stories -- In Their Own Words with the kind permission of Ms. Fenton. Our sincerest THANKS for the 102d Infantry Division Association allowing us to share some of their stories. Original Story submitted on 7 November 2009. Story added to website on 8 November 2009.